On August 9, 2018, CMS issued new proposed regulations for MSSP ACOs that, if finalized, will result in far-reaching changes in the program. The motivation for the proposed changes, which CMS calls “Pathways to Success,” is simple: CMS wants to move ACOs to risk more quickly. The great majority of 2018 participating ACOs are not taking on risk, and CMS analysis indicates that ACOs that don’t take on risk increase Medicare spending. Whether or not you agree with CMS’ analysis of MSSP savings it is not a surprise that six years in, some significant redesign would be on the table. Though still just proposed, there are a few big changes that will require sound, objective business decisions to address the challenges and opportunities the proposed rules represent. We focus on six. The comment period on these proposed rules will end on October 16, 2018. No date has yet been specified for release of the final rules. Existing ACOs with agreements that expire at the end of 2018 would get a six-month extension, and the new program would start July 1, 2019. Applications for the new program would occur in the spring; no date has been set. While some of the percentages and timeframes might be adjusted in the final regulations, the basic structure of the proposed program will likely become final. ACOs should begin assessing options now. The proposed regulations require that ACOs take on downside risk within three years—less for “experienced” ACOs. The agreement period is increased from three to five years (five years and six months if beginning July 1, 2019). There are two tracks, BASIC and ENHANCED, compared with four under existing regulations (1, 1+, 2, 3). The BASIC track entails a five-year sequence (CMS calls it the “glide path”) of increased upside sharing (up to 50%), with 30% downside sharing starting in year 3 (Exhibit 1). After one such five-year agreement period most ACOs will need to move to the ENHANCED track, with at least 40% downside risk-sharing. ACOs have the option of taking on more risk, sooner. During the upside-only period (Levels A & B), ACOs would only receive up to 25% of the savings they generate as compared to 50% under the current program; in Level C they would receive just 30%. This lower share is designed to encourage taking on downside risk, but it may drive current and prospective ACOs away from the program. Re-entering, Renewing, New Entrant: A re-entering ACO is one that had prior agreements that expired or terminated, or a new legal entity where 50% of the ACO participants had recent prior participation in an ACO. A renewing ACO has participated continuously. A new entrant ACO is one in which over 50% of the ACO participants have no prior participation in a Medicare ACO. Inexperienced vs. Experienced: The experience referred to is participation in a risk-based track. An inexperienced ACO has never participated in such a track, even though it may be in its sixth year of participation in MSSP. Low vs. High Revenue: The determination of low vs. high revenue would be based on the percentage of Part A and B FFS spending for assigned beneficiaries that is captured by ACO participants. Where the figure is under 25%, the ACO is typically physician-led and would be designated as Low Revenue. if it is above 25%, the ACO would be High Revenue; these ACOs typically include hospitals. 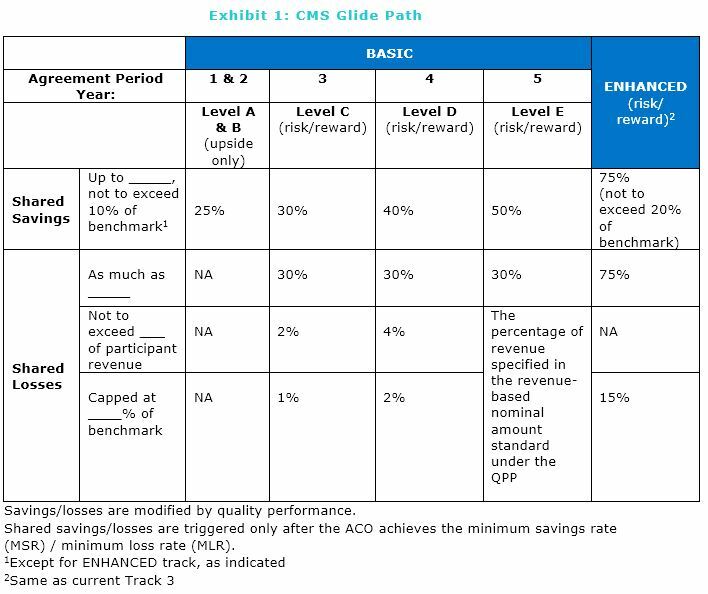 As can be seen in Exhibit 2, Experienced High Revenue ACOs (those who have previously been in risk tracks) would only have the option to participate in the ENHANCED track, with full risk-sharing. Experienced Low-Revenue ACOs would be able to renew for a second agreement period at BASIC Level E, giving them some limited advantage, consistent with CMS’ belief that physician-led ACOs are more effective. ACOs that have never taken on risk could join the new program at Level A (if a New Legal Entity) or Level B, which would give them a year (two, for new entities) before they would have to take on risk in the glide path. Under the proposed rule, the benchmark would be risk-adjusted annually for changes in assigned population health status (as is now the case after year 2). The adjustment would be limited to plus or minus three percent over an entire five-year agreement period. This limits the potential benefit to ACOs from improved coding. The proposed rule would also include a modified regional component in setting the ACO’s benchmark, starting with the first agreement period under the rule and increasing throughout the glide path, rather than setting the initial benchmark based solely on the ACO’s own expenditure history as is currently the case. A second cap on the regional adjustment amount would be based on the dollar amount of 5 percent of national Medicare fee-for-service per capita expenditures; this would affect only a small number of ACOs. Advanced APM status under the Quality Payment Program is available only to ACOs participating under the BASIC track-Level E, or the ENHANCED track. If an organization currently in Track 1+, 2, or 3 chooses to terminate ACO participation due to the new rules, participating physicians may lose the benefit of the 5% payment premium under MIPS, as well as the advantage of avoiding reporting requirements under MIPS. Currently, all Track 1 and 2 ACOs must use retrospective attribution, and all those in Track 1+ and 3 must use prospective attribution. Under the proposed regulations, all ACOs in either BASIC or ENHANCED tracks would have the opportunity to select prospective attribution, or preliminary prospective assignment with retrospective reconciliation, on a yearly basis. Prospective attribution would allow ACOs to better target care management efforts. “Pathways to Success” also includes other proposed changes that could have a significant impact for a particular ACO. Each ACO must evaluate the impact of these changes combined with the six big changes above, based on its particular circumstances. How will this affect our “volume to value” trajectory? Do we want our employed physicians on MIPS or in a risk arrangement? How can we help our independent physicians navigate this decision? Will large physician groups or other systems gain competitive advantage by embracing risk? Is Medicare Advantage a more attractive strategy? Sound decisions will require both accurate financial analysis of the new ACO model and consideration of these strategic issues.